About twenty minutes’ drive south-west of the Lithuanian capital, Vilnius, just past the settlement of Pagiriai, a dusty tree-lined road heads west behind a little red Dina petrol station. The road is flanked on either side by silver birch and small evergreens, which break every so often to reveal tired concrete benches where buses pull up several times a day. It could be any road in Lithuania, or anywhere in the Baltic. But it’s not. It is the road to Keturiasdešimt Totorių, a tiny village whose founders played a big role in medieval Baltic history, especially that of Lithuania. The most remarkable thing about these long forgotten heroes of Lithuanian history is their identity. Keturiasdešimt Totorių means ‘Forty Tatars’. This is the first clue. The second clue has to be seen from the air. Keturiasdešimt Totorių’s streets and houses are laid out like an ancient Tatar military encampment, because those first settlers were soldiers brought here to protect Lithuania against the religious intolerance of the west, and most fascinatingly of all, the soldiers were Muslims. The story begins in the 14th century, when much of the Baltic region had united under the banner of the Grand Duchy of Lithuania. The Duchy was an interesting place to be in medieval Europe. Whilst western and southern Europe were being overrun by fundamentalist Christians and the east was slowly converting to Islam, in the north the Grand Duchy of Lithuania was a pagan kingdom with a tolerant and enlightened social order, especially when it came to religion. Unfortunately, the Germanic Christian Orders of the west had a different take on religious freedom – in that they didn’t believe in it. As far as they were concerned, everyone had to convert to Christianity, including the Grand Duchy of Lithuania. As a result, the two had been at loggerheads for quite some time, with the odd Lithuanian Duke even ‘adopting’ Christianity to try and appease the Orders, though this never seemed to last. As the 14th century drew to a close, the Grand Duchy was once again proudly pagan, led by a pagan duke, Vytautas, whose empire now stretched from the Baltic Sea in the north all the way to the Black Sea in the east. Vytautas also now had a number of powerful allies in the east where the Muslim lands were. In 1398, during a brief period of peace with the Christians and whilst campaigning near the Black Sea, Duke Vytautas decided to bolster his domestic defences by bringing back to Lithuania a large group of Muslim Crimean Tatars. The Tatars with their Mongol ancestry had a fierce fighting reputation and were renowned for their loyalty. Vytautas knew the peace with the Teutonic Knights wouldn’t last and so he settled these Muslims close to his capital, Trakai, in villages like Keturiasdešimt Totorių. This ensured the Tatar troops were no more than half a day’s march from the city walls. It wasn’t long before they were called upon. “When the Crusaders came to enforce Christianity, the Lithuanians said ‘we don’t like it, you know’. He (Vytautas) gathered a big army and then invited Muslim fighters to kick out the crusaders,” explains Ramadan Yaqoob, a direct descendant of members of that very first Muslim community. Today, Mr Yaqoob is the Grand Mufti of Lithuania and leader to the country’s 3,000 Muslims, half of whom are Tatar. The tensions with the Crusading Teutonic Knights came to a decisive head in 1410. On the 15th of July that year, both sides met near the east German town of Tannenberg (Grunwald) in what became known as the Battle of Grunwald. The Muslim Tatars joined an army of Lithuanian, Polish, Czech and Russian troops that numbered around 30,000. Together they faced 20,000 Teutonic Knights. The battle was a momentous one. Losing it would have meant the Grand Duchy giving up its tolerant pagan ways and becoming part of the lands owned by the Christian Knights. The Grand Duchy won and the Muslims secured their status as Baltic heroes. “After kicking the intolerant Christians out, he (Vytautas) said, ‘Ok, you helped us, you can stay here, you can practice your religion.’ He gave lands as a gift for them. He said, ‘you did a great job, you can stay,” explains Mufti Yaqoob. The land Vytautas rewarded the Muslim Tatars with stretches roughly from south of Trakai in Lithuania to the Polish city of Białystok in the west and the Belarusian capital Minsk in the east. This is where the Tatars have lived for almost seven centuries, assimilating and integrating with those around them. It is a length of time that has taken its toll. When they arrived in the 14th century, the Tatars spoke the Crimean language of Qipchaq, and contact between the Grand Duchy and its Crimean allies remained frequent. Even when Vytautas and his kingdom adopted Christianity – along the duchy’s own tolerant lines – the Tatars flourished, becoming landowners, tradesmen, bureaucrats and high ranking military officers. However, as time passed and various rulers of the duchy took a more conservative approach, contact with the east and the Crimea stopped. This led to the Baltic Tatars becoming isolated from their ancestral roots and co-religionists. By the 18th century, they had stopped using the Qipchaq language. “We have evidence that 250 years ago, the community was using the Arabic alphabet to write Slavic words. They had lost the Qipchaq language by this time,” says Mufti Yaqoob. In the 19th century, when the famous Russian Tatar orientalist Muhammad Murad Ramzi wrote about the community, he also observed that their understanding of Islam had been affected by isolation, claiming it had become nothing more than an ‘identity’. What limited knowledge of Islam they did have took a further blow in the 20th century, when Lithuania became part of the deeply secular USSR. “It was the worst time. All the people of religion and knowledge were either killed or sent into exile. Archives were burnt. Communities were closed. Islam was forbidden,” says Mufti Yaqoob. Before the Soviet era, Lithuania had around 25 Tatar mosques scattered all over the country, including the capital Vilnius. Today, only three survive, none of which are in the capital, they are all in obscure, ‘unimportant’ villages like Keturiasdešimt Totorių. Most people have to look twice. Initially, the mečetė (mosque) looks just like any other wooden hut you might see all over the Baltic countryside; a dark brown square made of neat vertical timber slats with a few small simple square windows and an apexed tin roof. It is unlike the mosques seen everywhere else in the world; no arabesque designs adorn the front, nor does it have a minaret by its side. The only clue is a crescent atop an ornate little turret with a small onion dome, where the tin roof’s point should be. Even the turret seems to belong elsewhere – a Russian church maybe? The Keturiasdešimt Totorių mečetė is the most European-looking mosque you are likely to see anywhere on the continent. It is a mosque completely at home in the Lithuanian countryside. This is hardly surprising, given that a mosque has stood here since 1558, maybe even earlier. 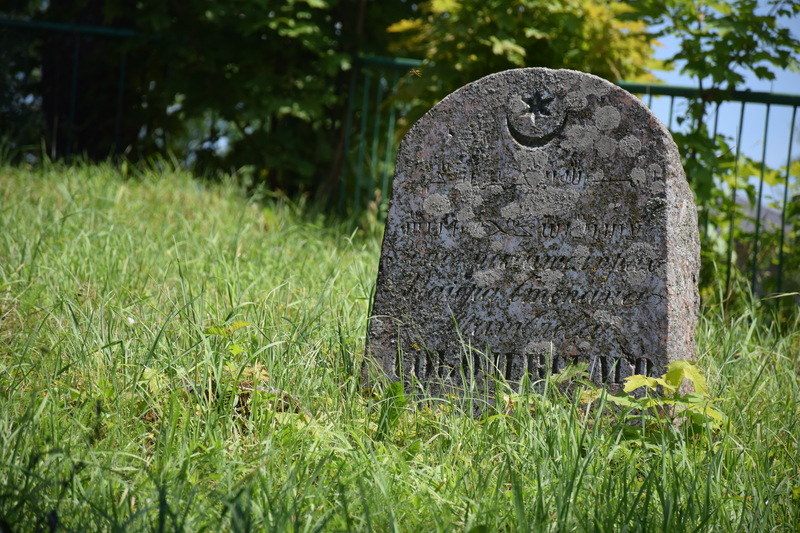 In the mosque’s cemetery there are graves said to date back to that time, though few markings remain, except on one. Allahberdi’s grave, from around 1621 is probably the oldest identifiable Muslim grave in all of northern Europe. “I cannot say I am something else. I’m a local, I’m a citizen, I cannot say that my parents came from somewhere else, I’m Lithuanian,” says Mufti Yaqoob. His words echo the sentiments of Lithuanian Muslim Tatars all over the country, including the 120 still living in Keturiasdešimt Totorių, some of whom claim direct descent to that very first community of Muslims that fought alongside Vytautas. Muslims make up a third of the village’s population and yet the mosque opens only on special occasions now, there are no daily services like elsewhere. “Most of the people here don’t even know how to pray anymore, so the mosque is only open for important ceremonies like funerals and religious festivals”, says Evginenia Jakubauskiene, a 65-year-old Muslim Tatar woman whose husband is originally from Keturiasdešimt Totorių. In a strange way, the oppression and isolation experienced by Evginenia’s people means the mosque has taken on a different, possibly more important, role now. “We lost our language and so much of our identity a long time ago. The mosques are very important. They are all that we have left,” says Fatima Stantrukova, a 70-year-old villager who volunteers as a caretaker at the mosque and nearby Tatar community centre. Inside the mosque, there are many of the features we have come to expect. The building is split into two rooms – one for men and one for women, with a small green net curtain covering the opening in the segregating wall. Both rooms have small wooden balconies at the back and several benches for those that have trouble kneeling and bending. The interior is entirely covered by floor to ceiling pine slats, giving it a distinctly Baltic air and it is carpeted throughout in a decorative blue design. On the carpet are arches pointing towards the holy city of Makkah in Saudi Arabia, the direction all Muslims must pray. The larger men’s room also has a brightly coloured wooden mimbar (pulpit) in the Turkish-style at the front. This is where the Imam delivers his sermons from. Next to it is the spot where the Imam stands to lead the prayer. These days the space is only occupied occasionally. One of these infrequent Imams is Aleksandras Beganskas, also known as ‘Hamza’. He serves the mosque in Nemėžis, another of the three remaining Tatar mosques in Lithuania. This one was used as a storehouse during the Soviet era. There is one other in the village of Raižiai. Like many older Tatars, Hamza has an ‘official’ name and a ‘Muslim’ name – another legacy of the Soviet era. Hamza, like Mufti Yaqoob is desperate to change the role of Islam and the mosques amongst his people. During Ramadan this year, Hamza led a congregation, which averaged ten worshippers for the daily late night prayers. It doesn’t sound like much in a village where the Muslim population is 400, but in previous years, there would have been none. Hamza is also the father of two children. His daughter has a Muslim name, and his son, an ancient Tatar name, Eldar. When Eldar grows up, Hamza wants him to train as an imam, something his parents’ generation could only have dreamt of for their own children. Four more mosques like the ones in Lithuania can be found in the lands presented to the Muslim Tatars by Vytautas. These now fall outside the modern borders of Lithuania, in the Polish towns of Kruszyniany and Bohoniki as well as the Belarusian towns, Navahrudak and Iwie. The mosques and the story of the community that built them are a timely reminder to Baltic and European people that Islam and Muslims are nothing new to this part of the world. It is also a story that reminds us of the importance of fighting intolerance just in the way those 14th century Muslims did, ensuring the survival of the Lithuanian identity. As one resident of Keturiasdešimt Totorių put it; in the current climate, a story like this is a “gift” for us all. Tharik Hussain is a British Muslim travel writer and journalist who specialises in the Muslim heritage of Europe. He has written about the Islamic history of places as diverse as Romania, Ireland and Spain. Tharik blogs as the Wandering Musulman and all of his published work can be seen on his website.